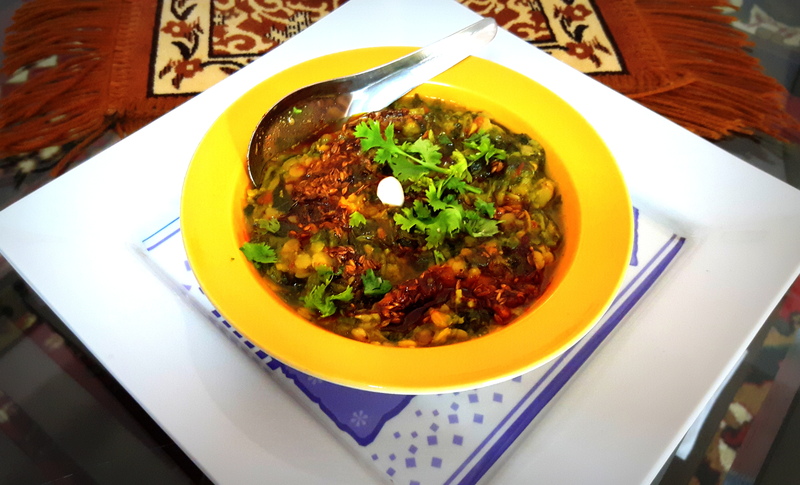 First time I made this recipe years ago, when one of my family friend visited us suddenly, I didn’t have sufficient vegetables to prepare the meal, made this recipe and they were surprise to know that it is bread kofta in palak gravy… they liked this very much. 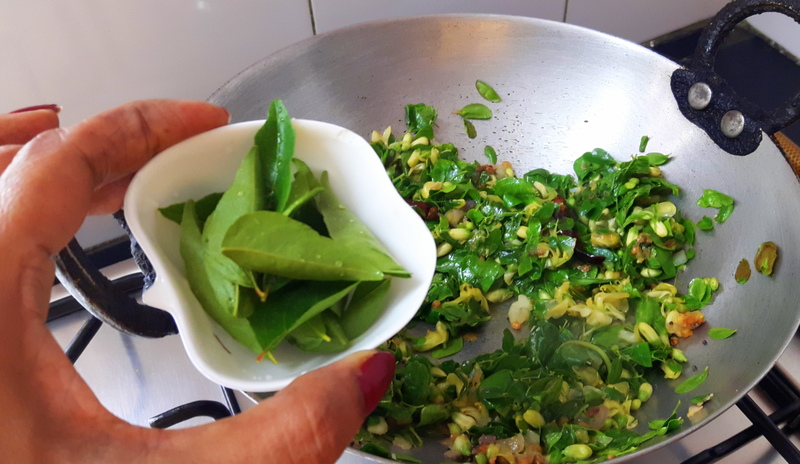 Spinach is without doubt the most important green vegetable; it contains many different nutrients, vitamins, folic acid, which keeps our skin looking young and bright. 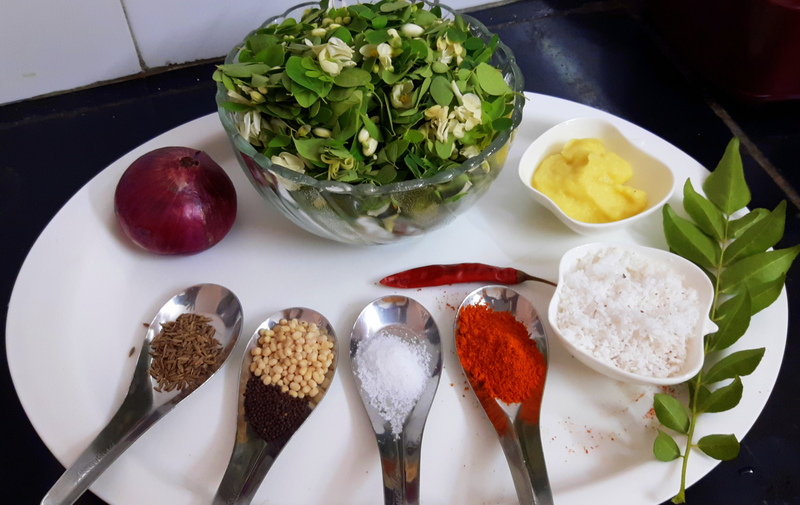 Fresh coriander leaves: 20 gm. 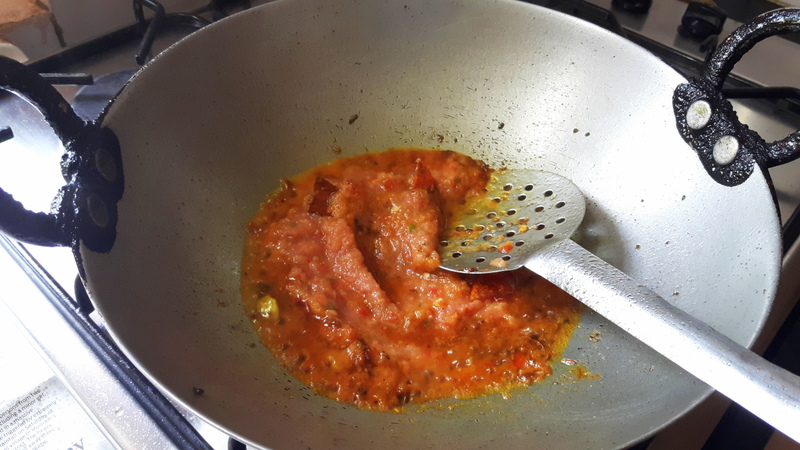 Cut onion and 1 tomato, grind them to smooth paste. Keep aside. 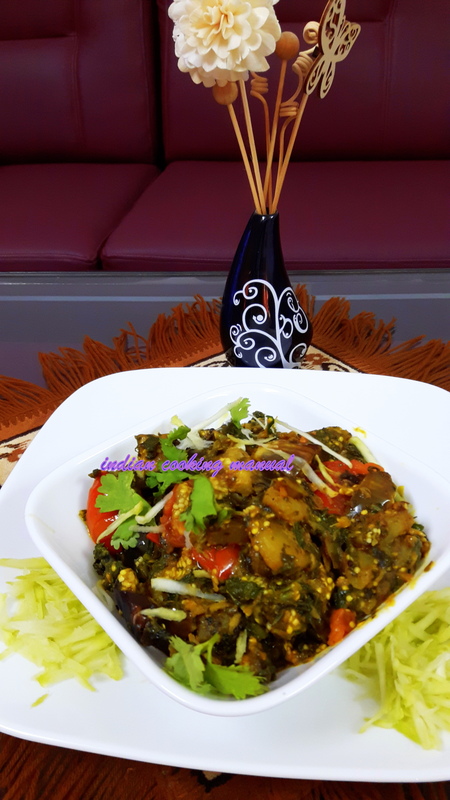 Chop cashew nut, green chili and coriander leaves and 1 tomato, keep aside. 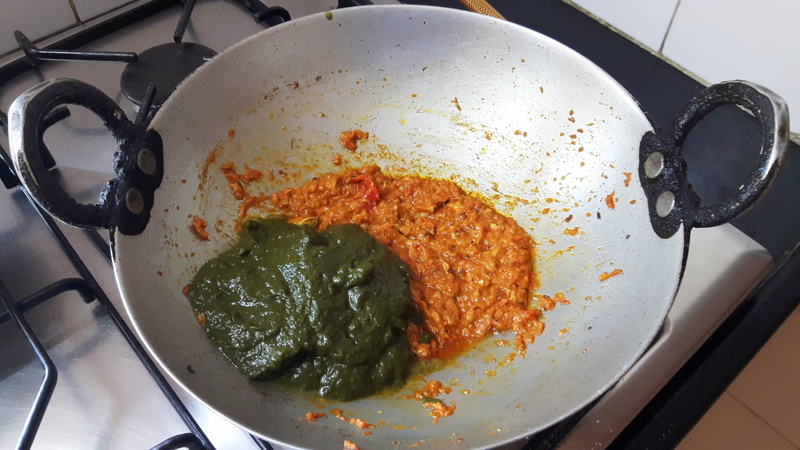 Blanch/Boil or microwave palak for 3 minutes and grind to fine paste, keep aside. 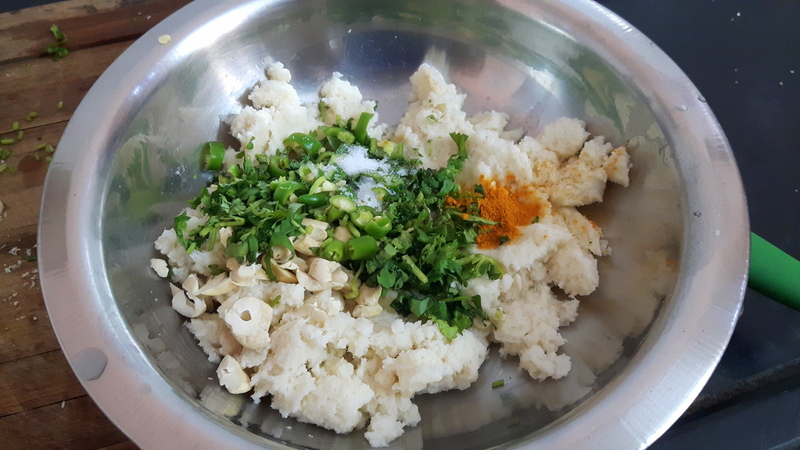 Discard the edges of bread, soak the bread into water and squeeze it and keep it into mixing bowl, add salt, chopped green chili, chopped coriander, cashew nut and pinch of turmeric powder, mix well and make dough, divide the dough into10-12 part, make lemon size ball, keep aside. 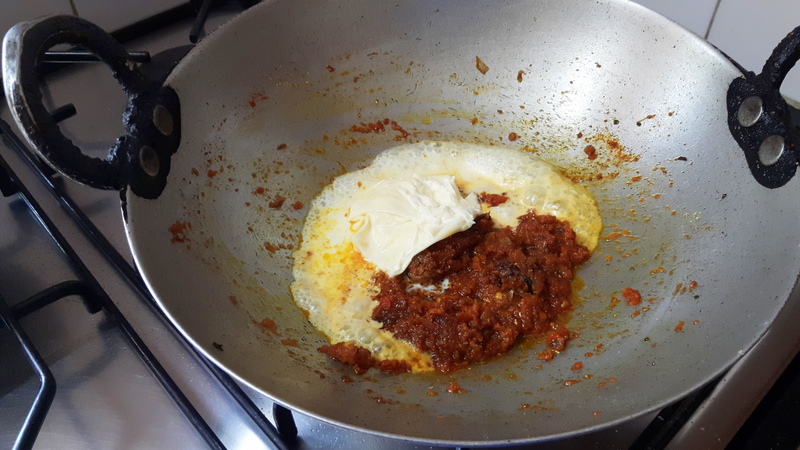 Take a heavy bottom pan. 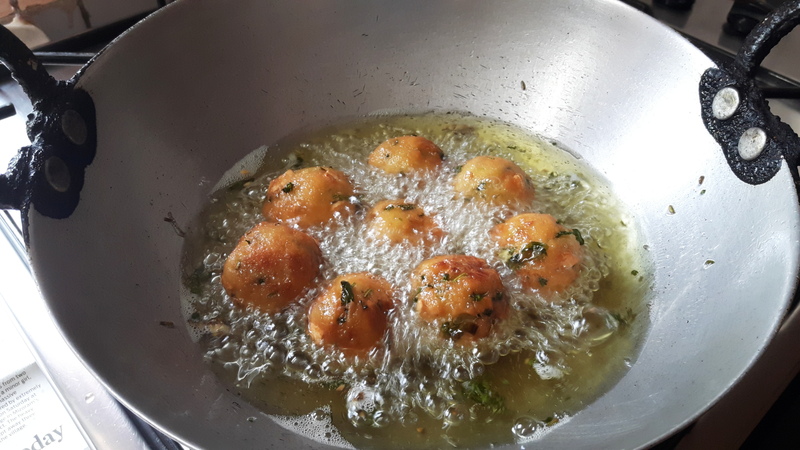 Put oil in a pan, when smoke starts, add 3 – 4 bread balls (kofta), and deep-fry the kofta on medium flame till light brown in color, remove and keep aside. 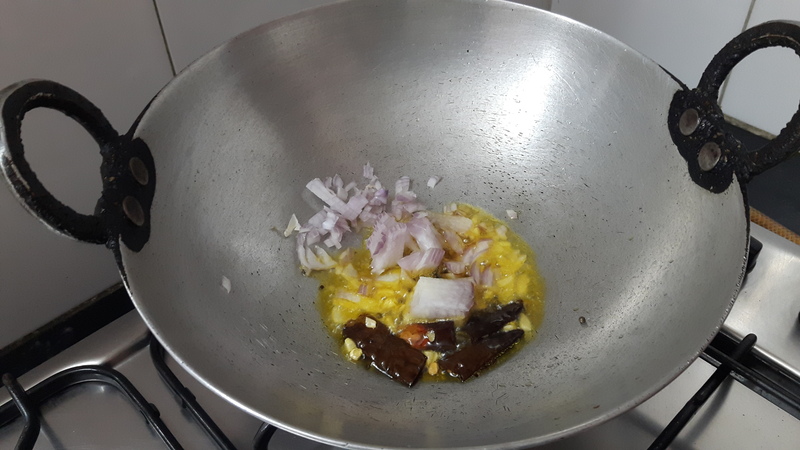 Repeat till all kofta is fried. 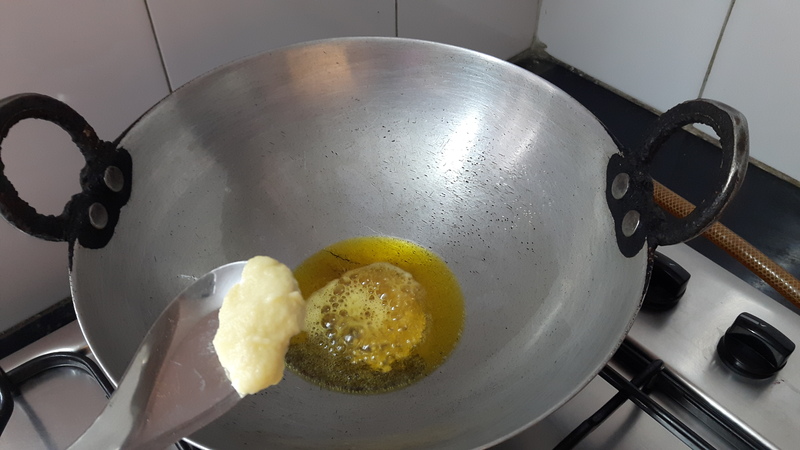 Put 2 tablespoon of oil into the pan. 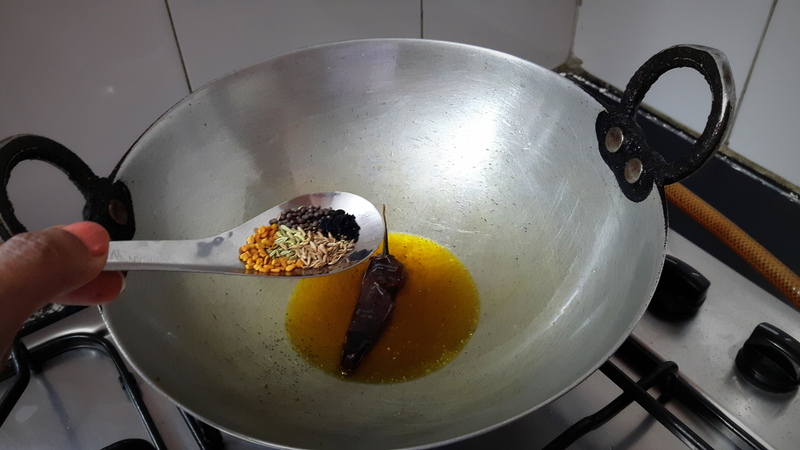 When smoke starts, put whole Garam masala (green cardamom, mace, clove, Cumin seed and cinnamon), Sputter it for few seconds. 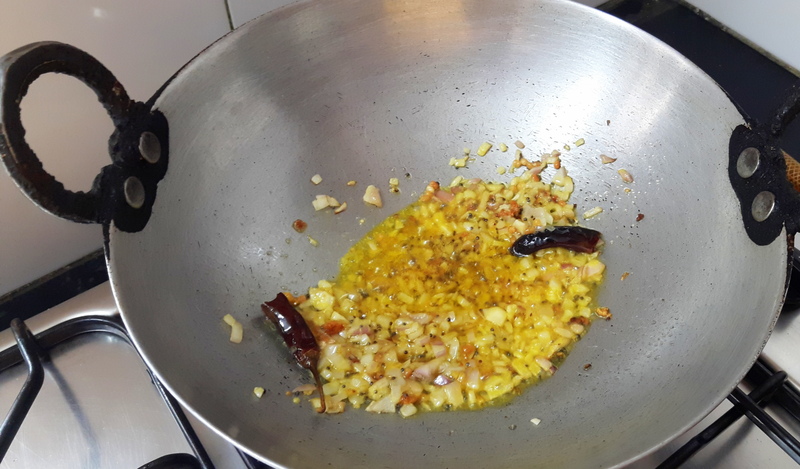 Add grinded onion paste, garlic and ginger paste, Fry these masala till liquid dries up. 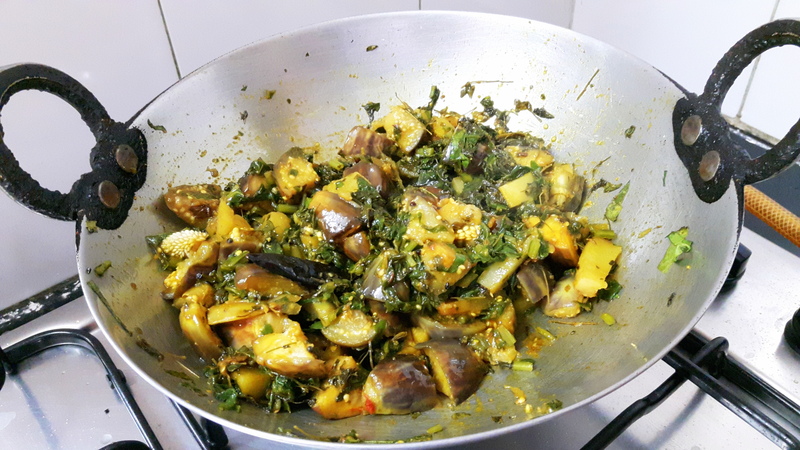 (About 2-3 minutes on medium flame), Add red chili powder, coriander powder and turmeric powder, fry for few seconds. 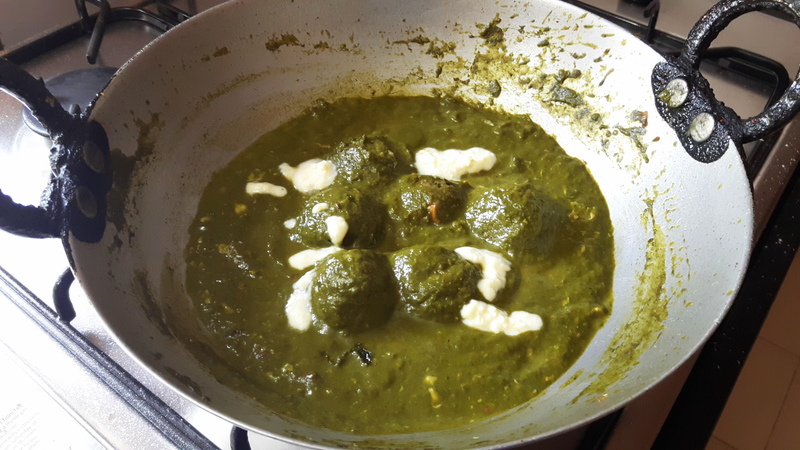 Add fresh cream and palak paste and salt, put half cup water, and just boil it, add fried kofta and bring it to boil, add Garam masala powder. 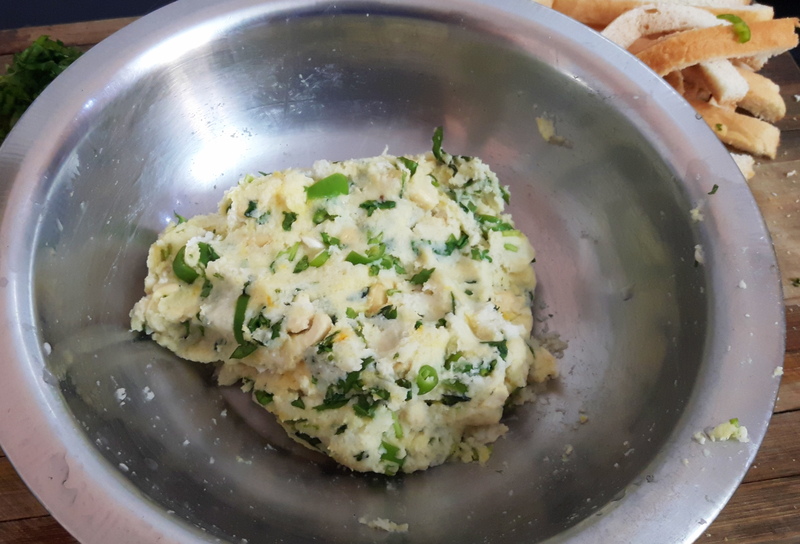 Transfer it to serving bowl, garnish with fresh cream or butter. 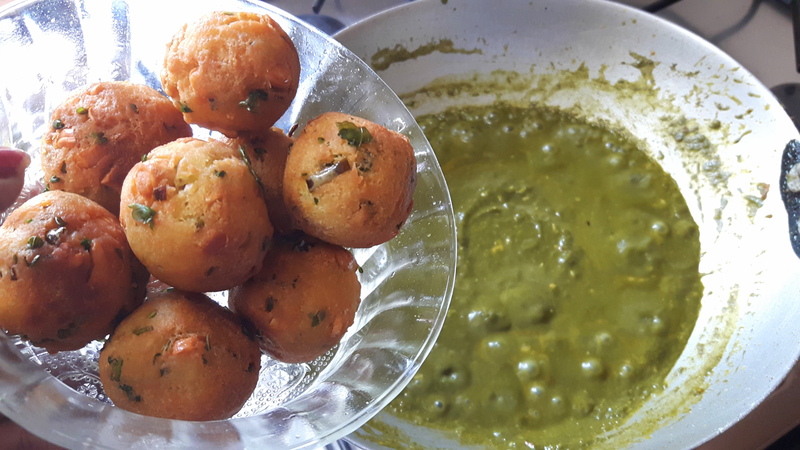 Bread kofta in palak gravy (bread kofta in spinach curry) is ready to serve, serve hot with roti or paratha. 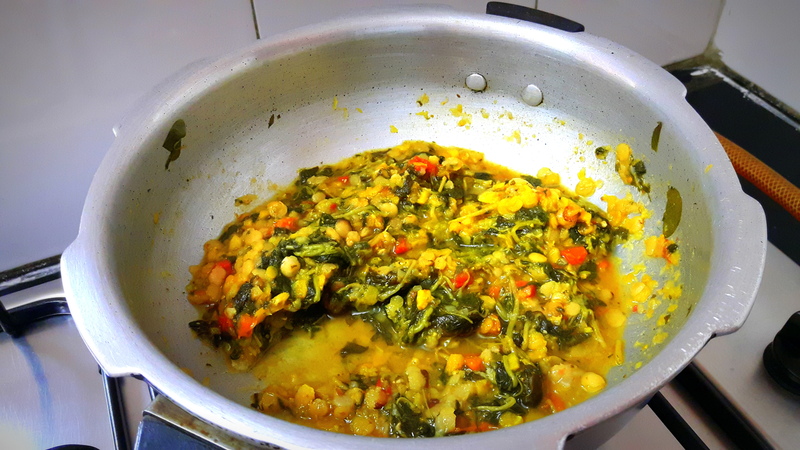 Almost in all state of India people cooks this laal saag in their own way. 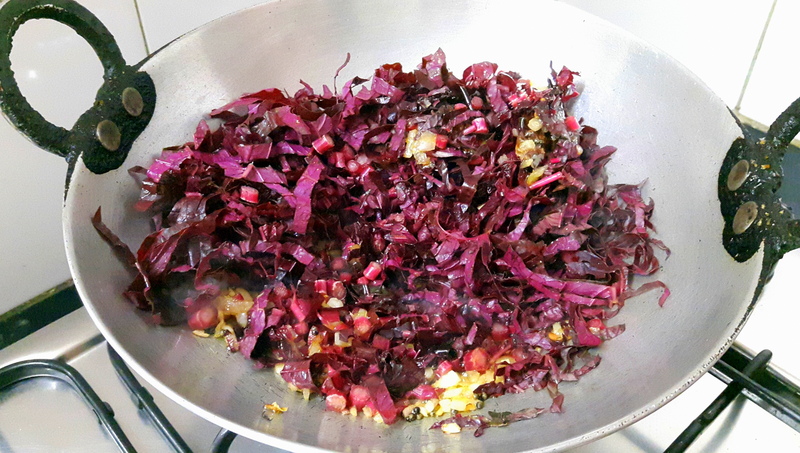 It is one of my favorite vegetable since my childhood days; I was especially fascinated by its beautiful color. 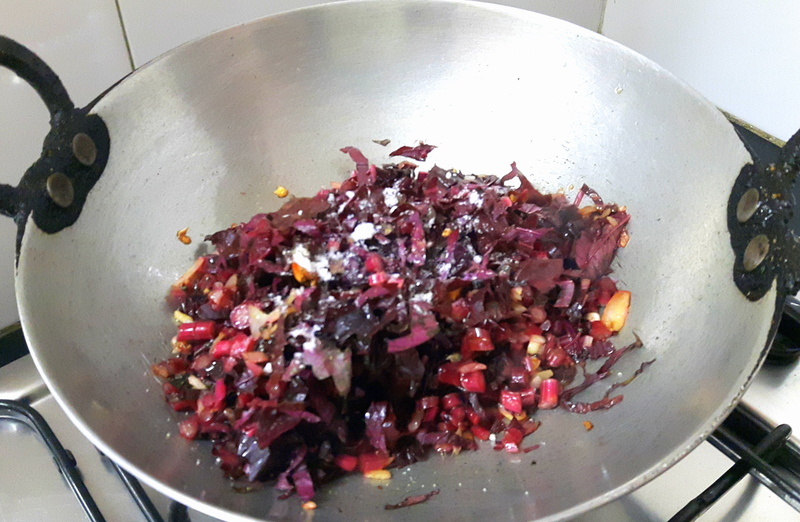 It was fun to mix and eat with steamed rice as rice too gets beautiful red color. 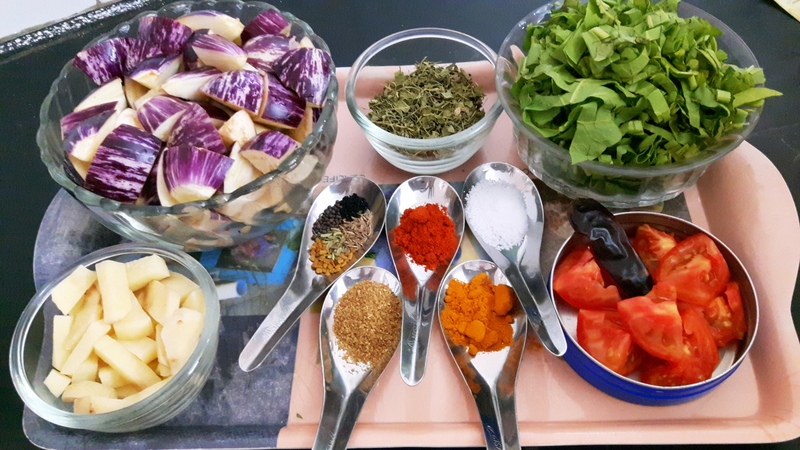 It is easy to cook; only 4-5 ingredients is required. 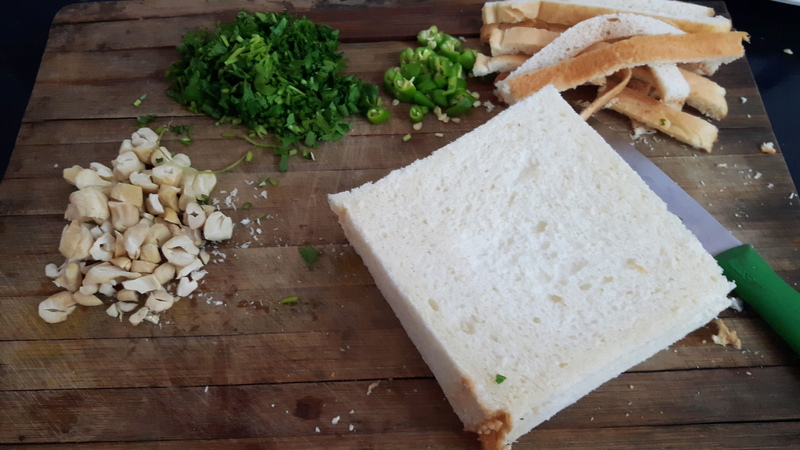 You will love the recipe. 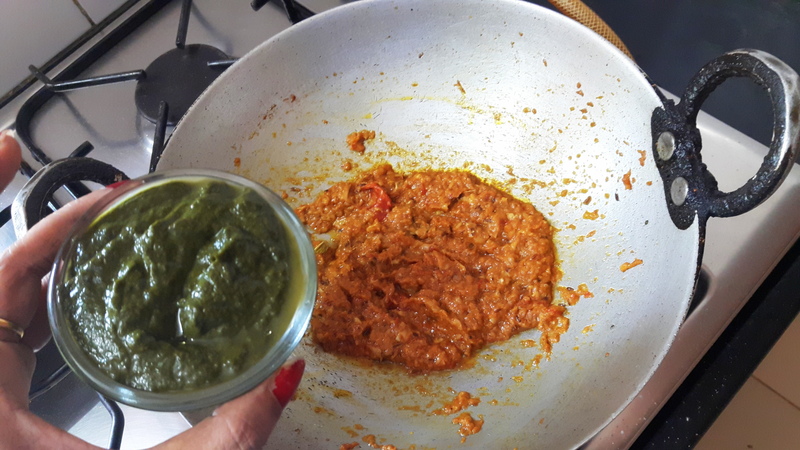 Regular consumption of lal saag reduces blood pressure and cholesterol level; this is a power house of iron, calcium, vitamin A and c.
Clean, wash and Chop laal saag leaf roughly. Keep aside. 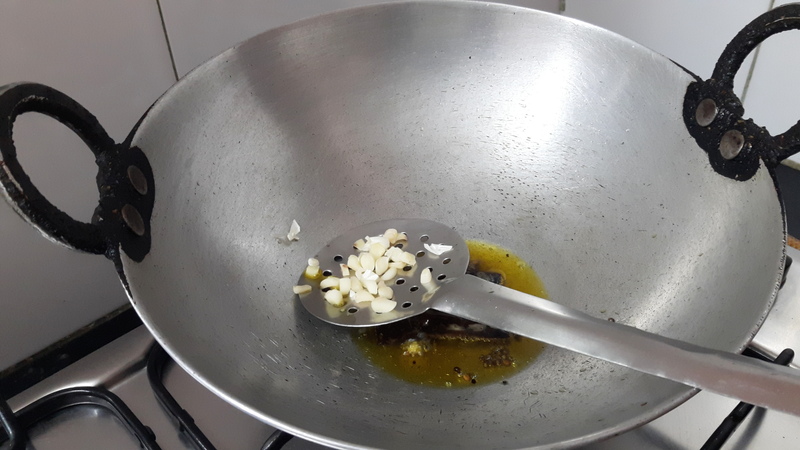 Chop onion and garlic into small pieces. Keep aside. 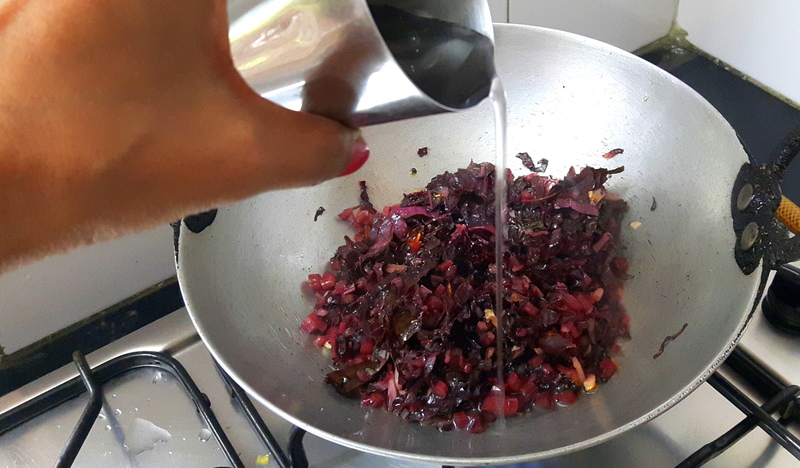 Cut red chili into 2-3 pieces. Keep aside. 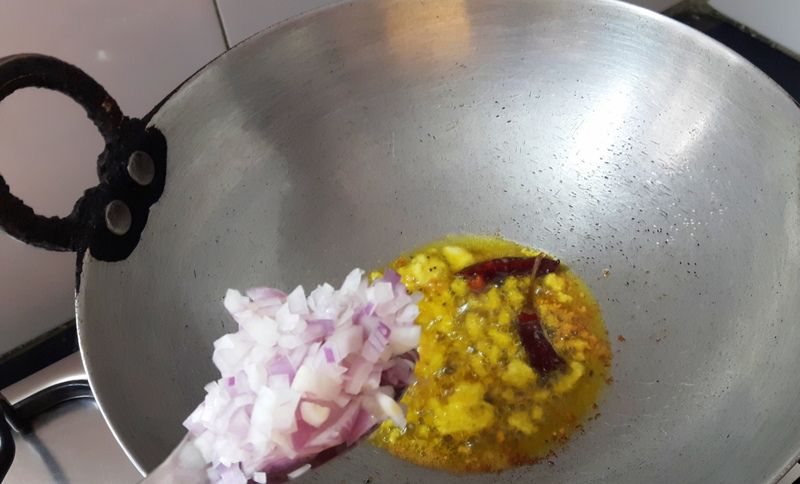 Take fry pan, put oil and heat, when it smokes add mustard seeds and red chili wait till it sputters, add onion, garlic, stir and fry (keep it stirring otherwise it may burn). 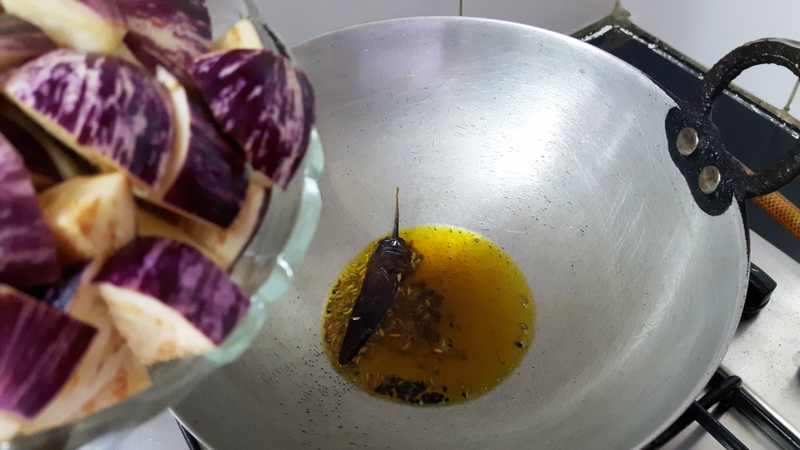 Fry till onion become translucent, add laal saag leaf, stir well and fry for few minutes. 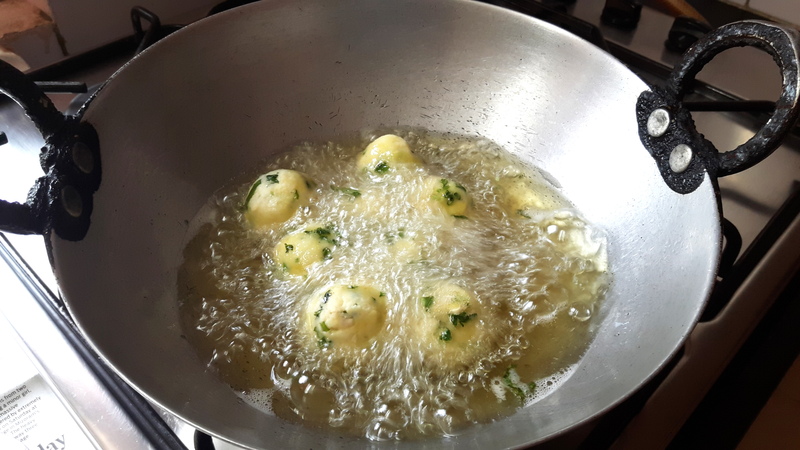 After few minutes it will change the texture and starts shrinking, put half cup of water. 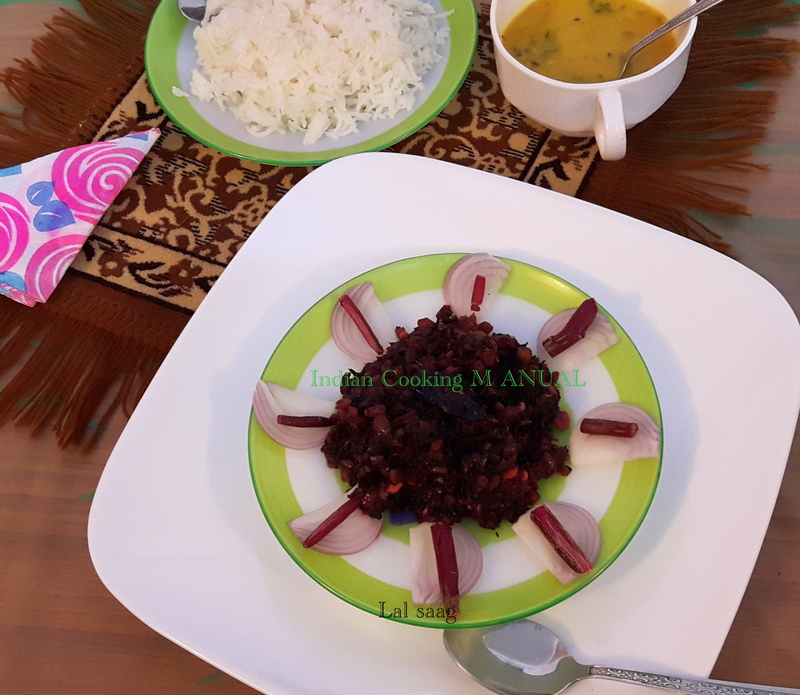 Cook for 10-15 minutes on medium lower heat. 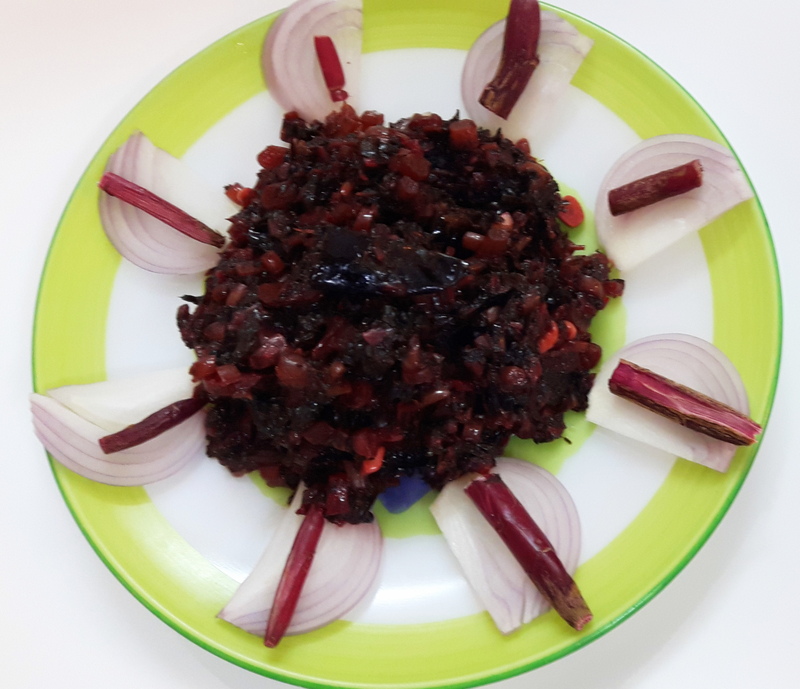 This Baigan ki sabji is without onion and garlic, very authentic and traditional sabji from Awadh, Uttar Pradesh. 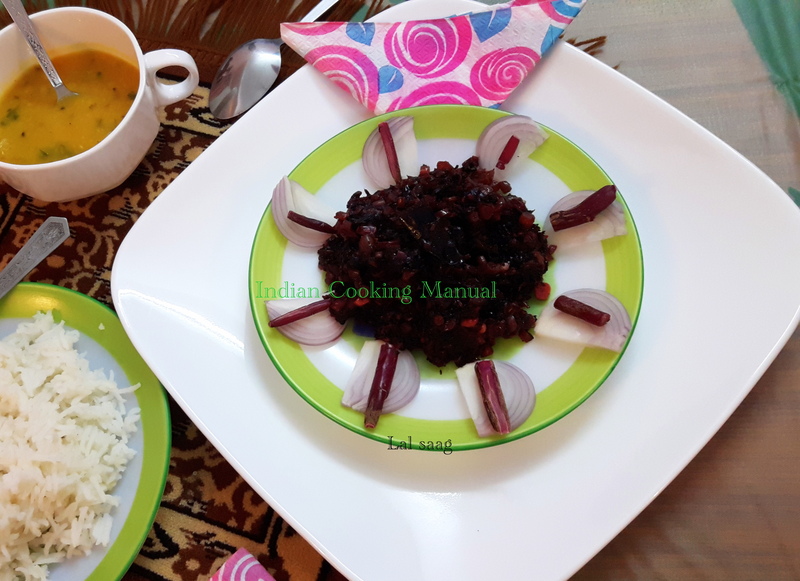 The Avadh style cooking is the Dum style cooking. That means cooking on low flame. 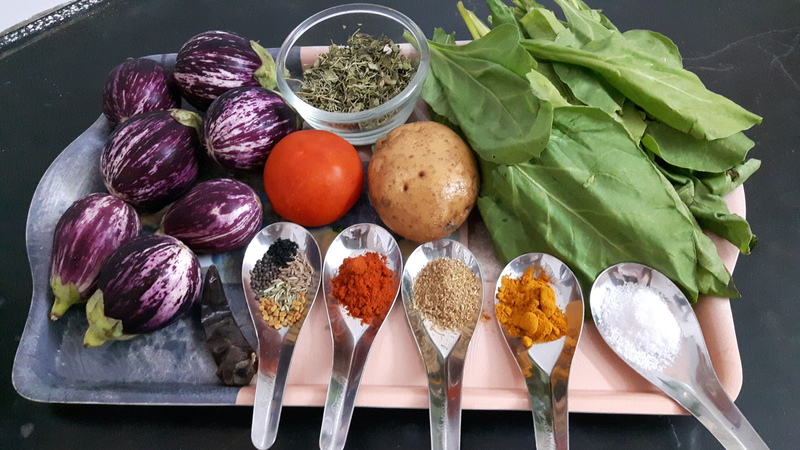 Here I used the kasuri methy, spinach, mustard oil that adds the unique taste and health benefits too. 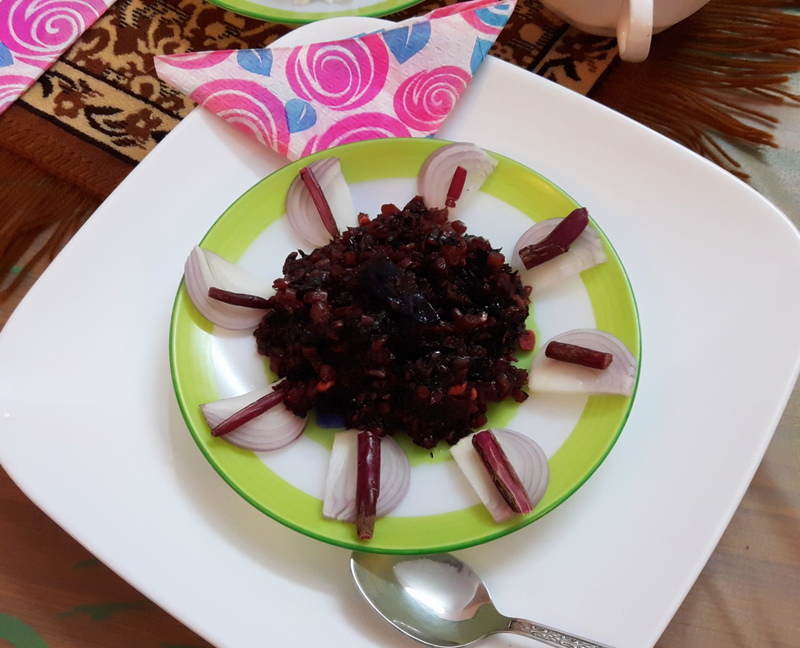 Cook this recipe today and enjoy! Please don’t forget to write me. 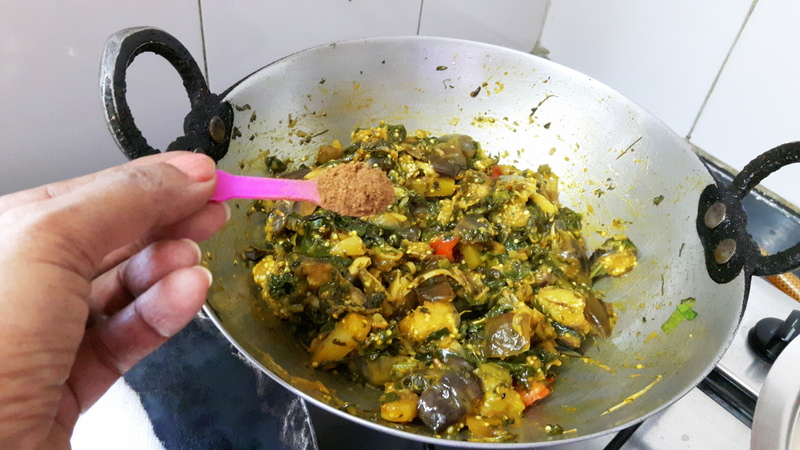 Dry mango powder: ½ teaspoon (You can use fresh raw mango). 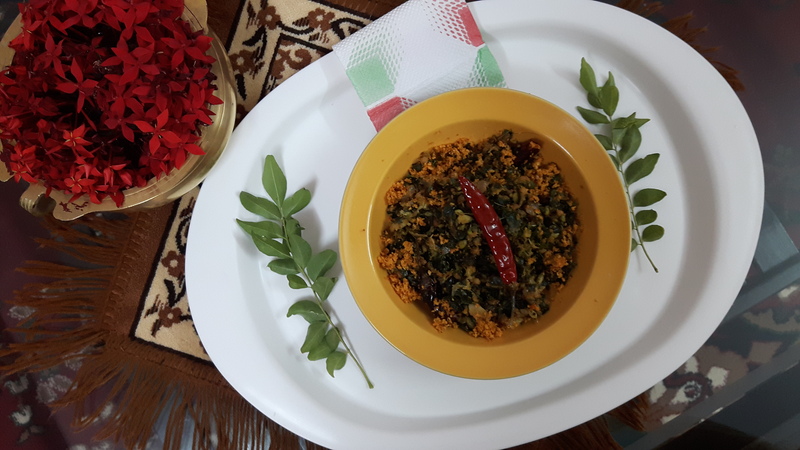 Kasuri methi: 2 tablespoon (You can use fresh fenugreek leaf). 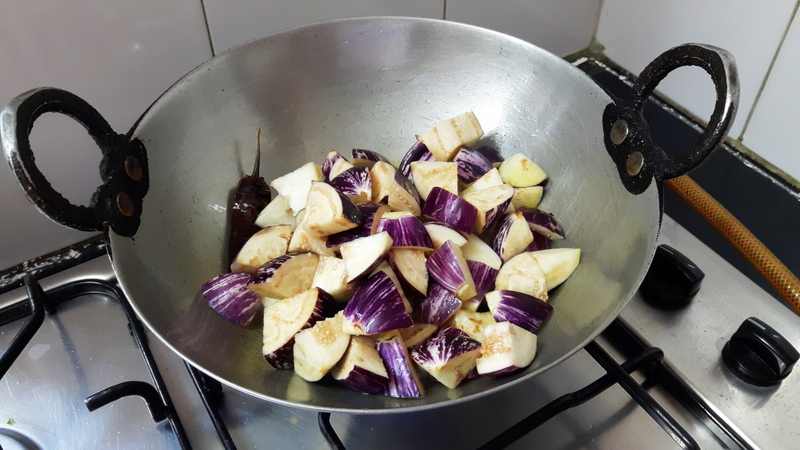 Cut egg plant into small pieces (~ 1”pieces), keep this in a bowl filled with water otherwise it will turn dark brown due to high iron content. Keep aside. 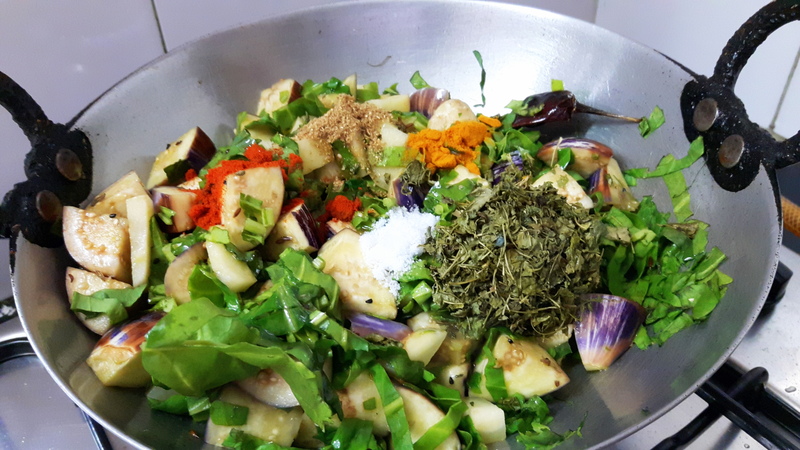 Peel off and chop potato into small pieces. Keep aside. 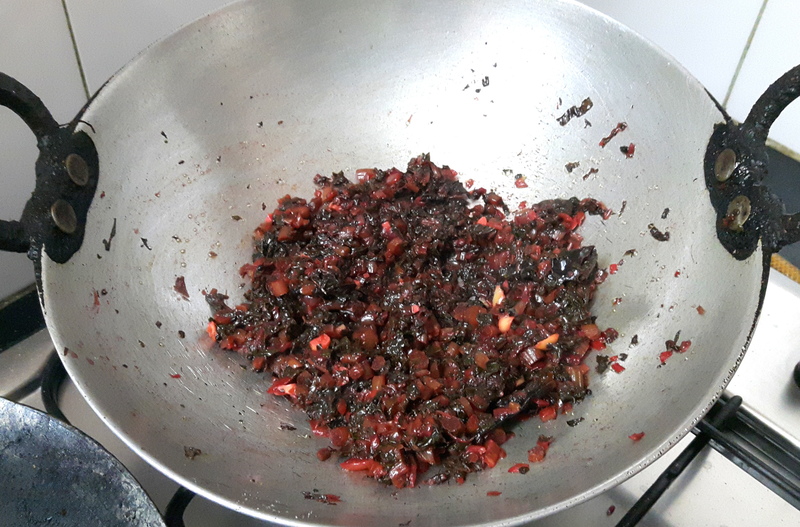 Chop tomato into small pieces, keep aside. 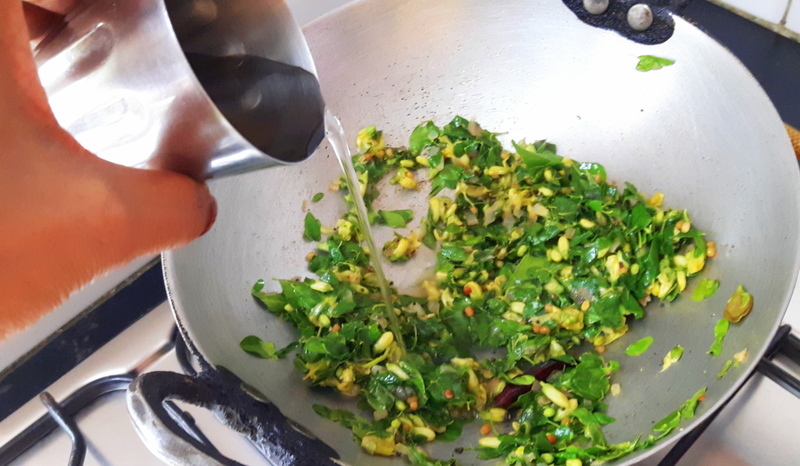 Roughly chop spinach, keep aside. 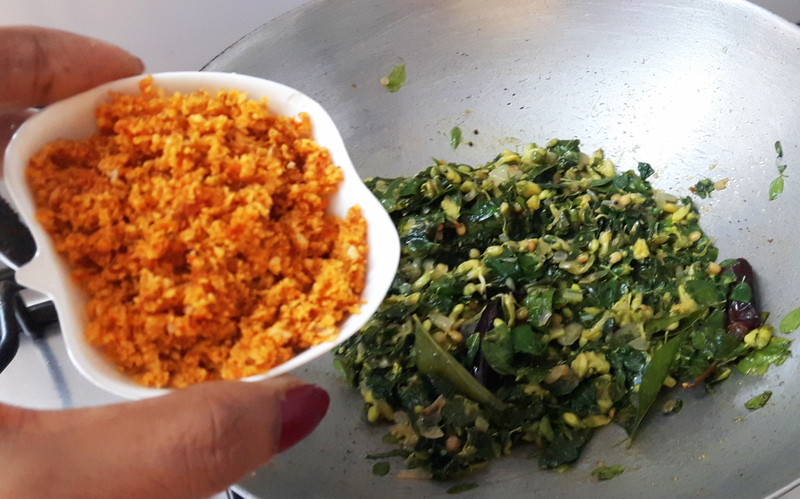 Add panch phoran and red chili, Sputter it for few seconds. 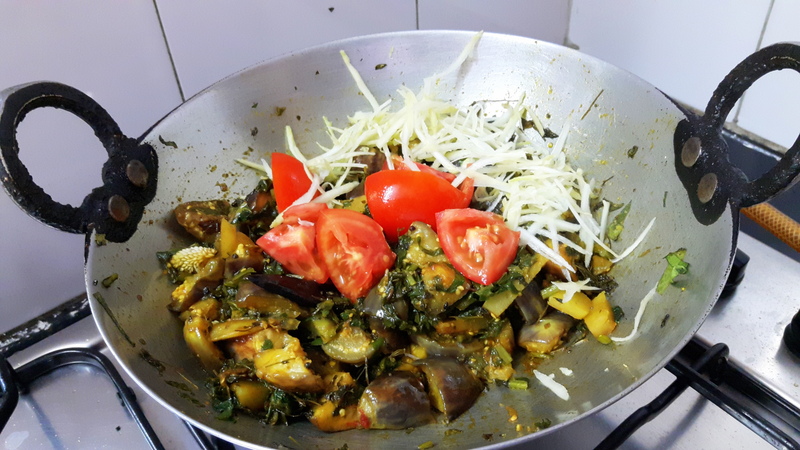 Add egg plant (baigan), potato, spinach stir properly. 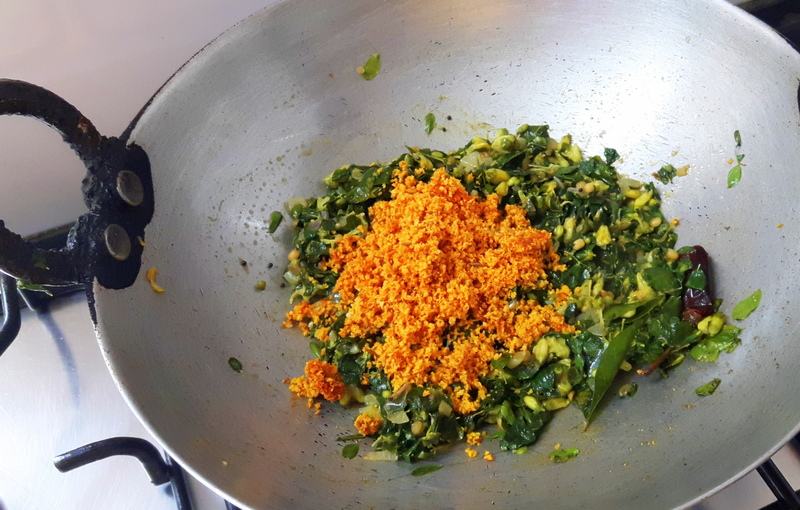 Then add kasuri methi, chili, turmeric, coriander powder and salt stir it. 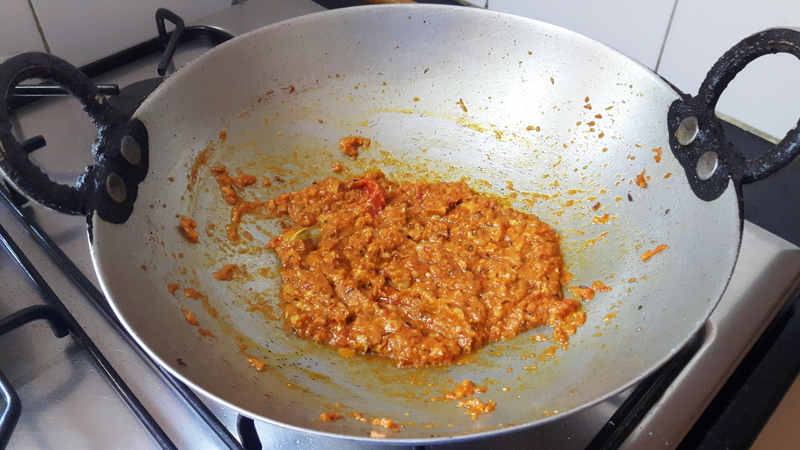 Reduce to low flame, cover the lid. 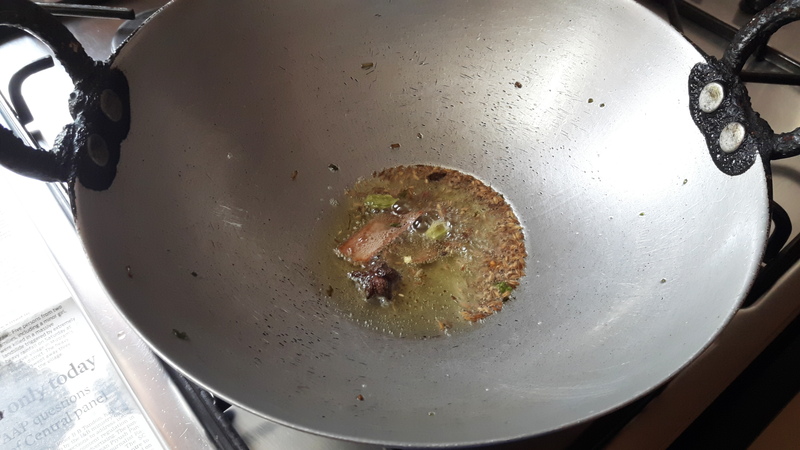 Stir occasionally, so that it should not burn. Cover for 8-10 minutes till vegetables are 80% done. 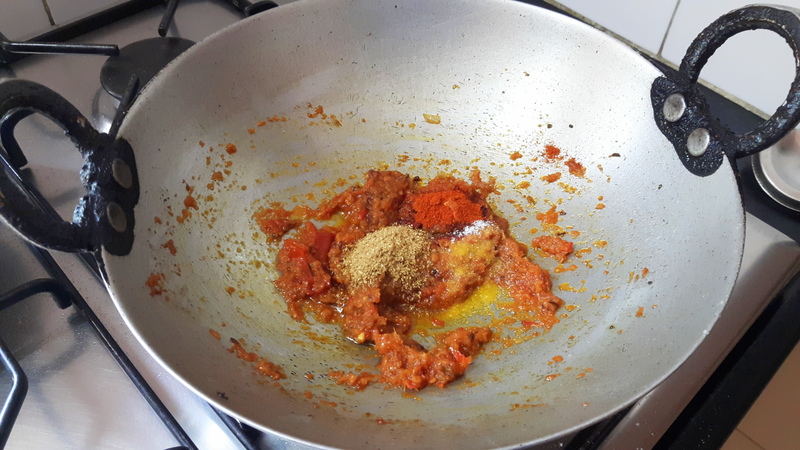 Add tomato stir it; cover the lid again till vegetables are done. 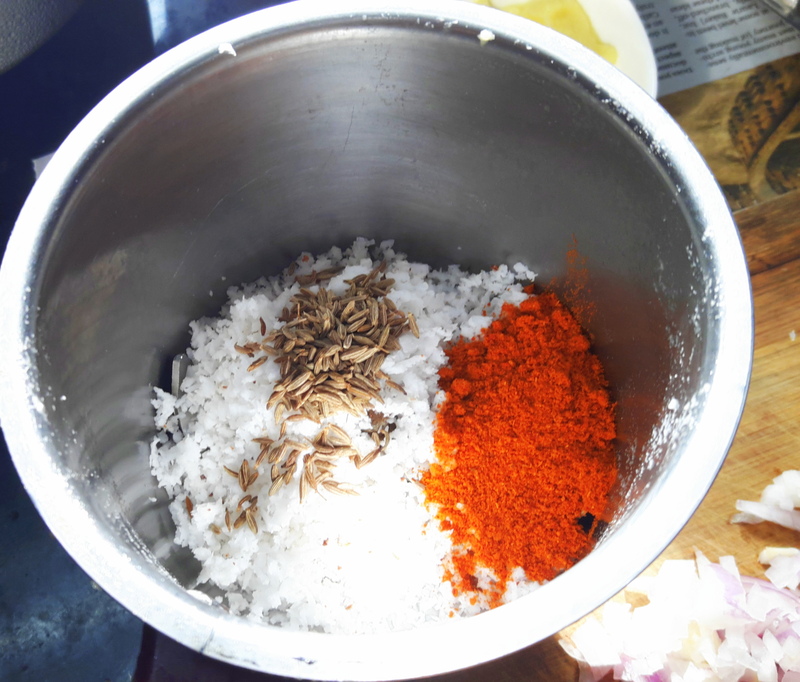 Add Garam masala powder and Put off the flame. 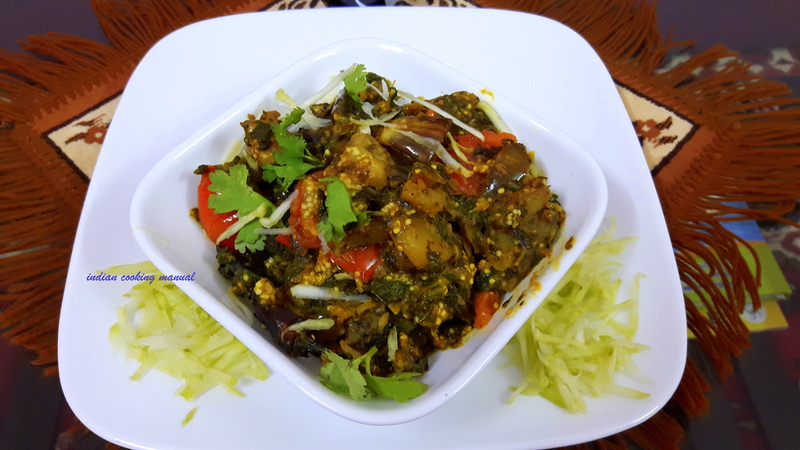 Baigan/brinjal ki sukhi sabji (egg plant ki dry sabji) is ready to be served. 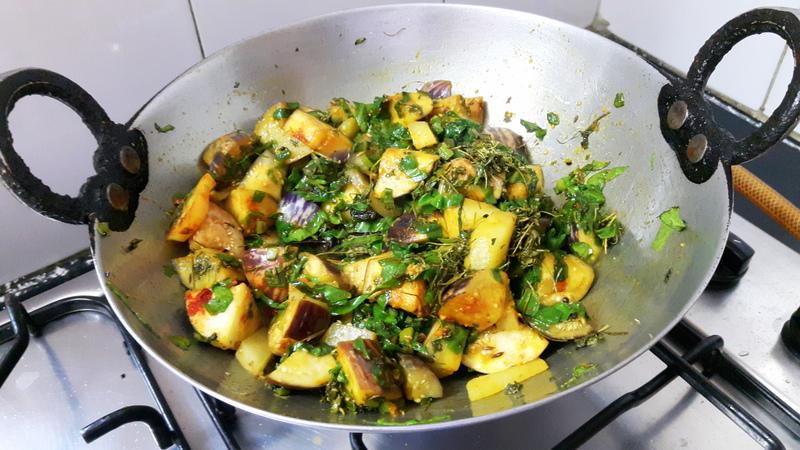 Transfer the sabji into serving bowl and sprinkle the coriander leaves. 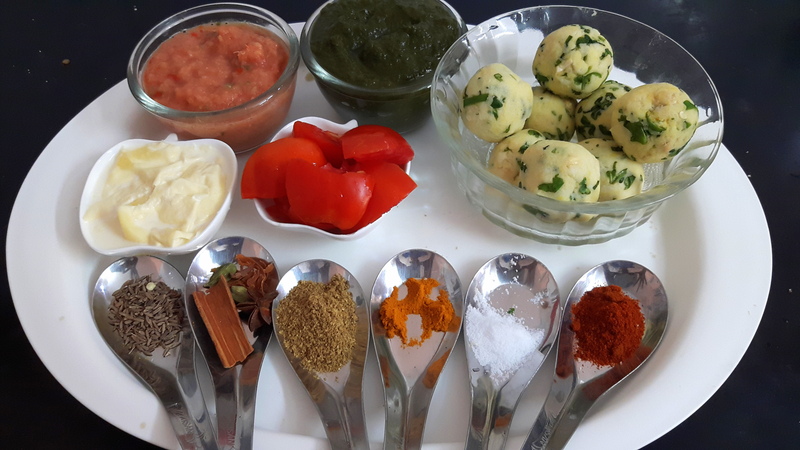 Serve hot with paratha, poori or rice. 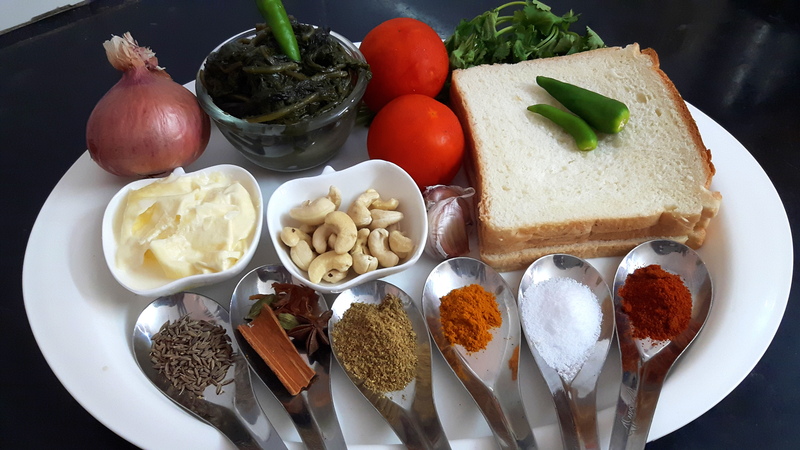 “Good things come in small packages” this recipe is powerhouse of nutrients. 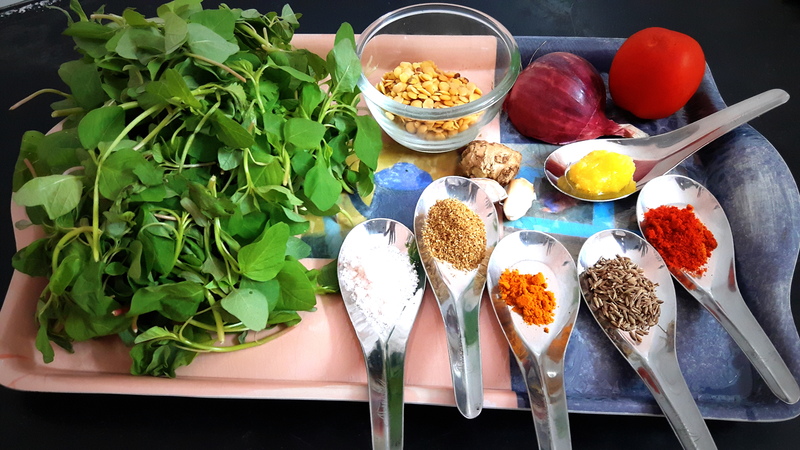 Due to our busy life style, we need more nutrition which is otherwise required for our health and strength? 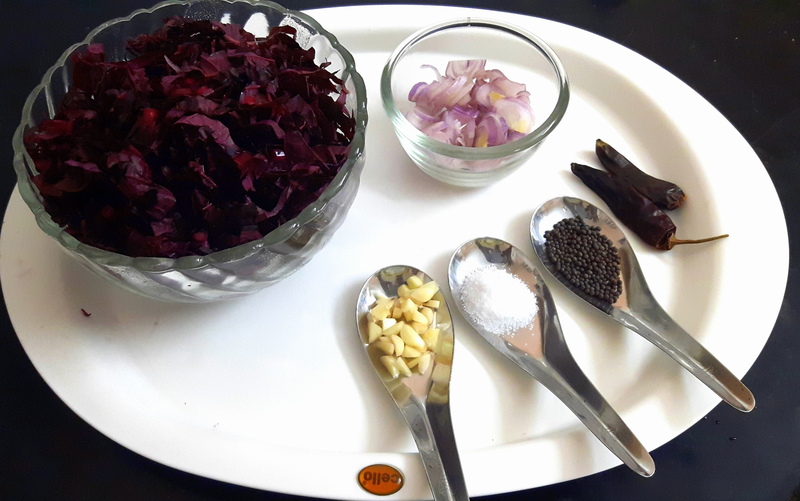 Here I am going to upload a quick method of preparation of super food; the best thing about this is that it doesn’t take much effort or time to prepare. 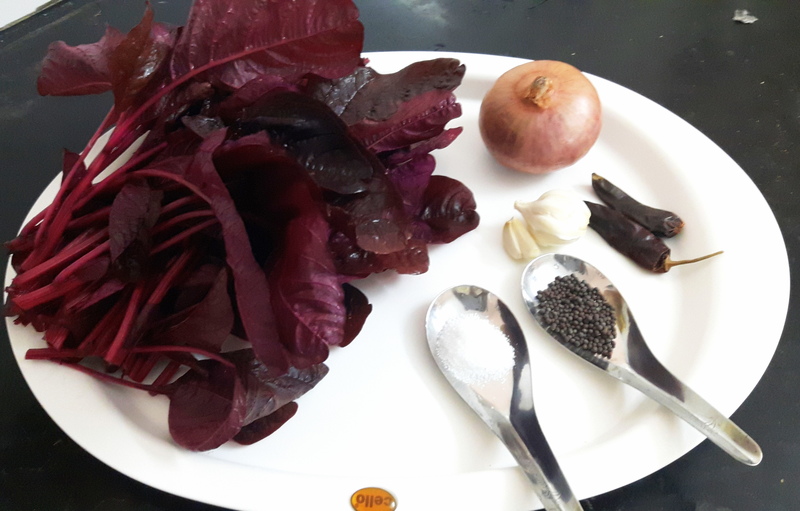 As you know amaranths improves your RBC count and has 30% higher digestible protein than other plant sources. 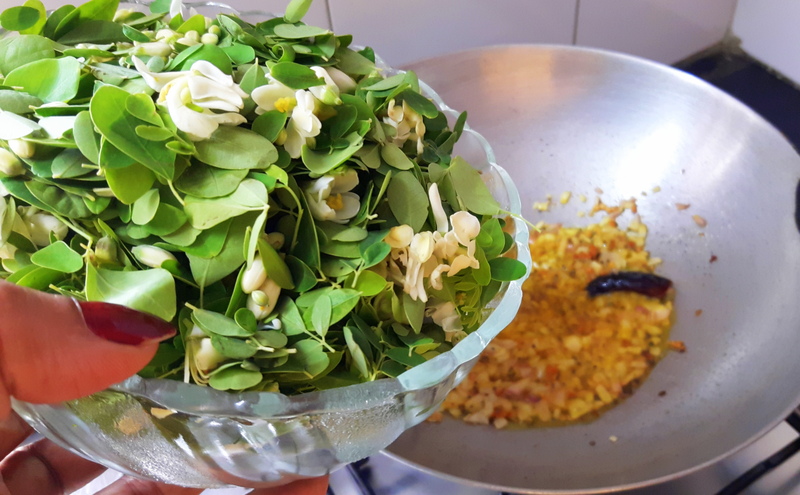 It easily goes with chapati / bread or rice and makes the complete meal. 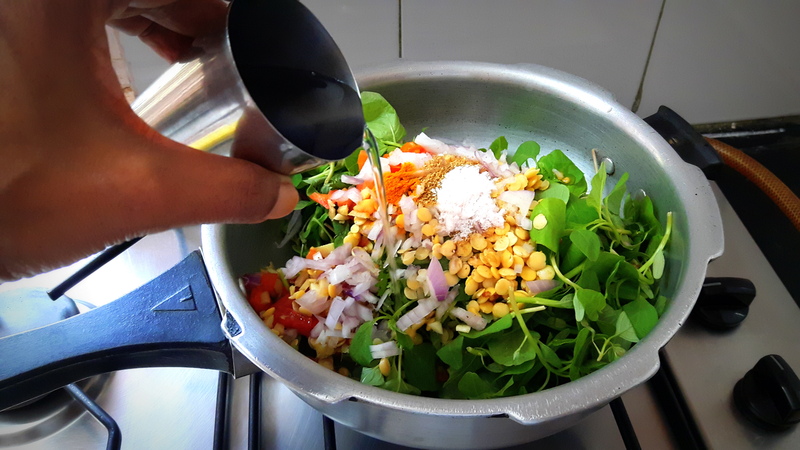 It gives you enough nutrition and fuel for the day and that too almost without oil. 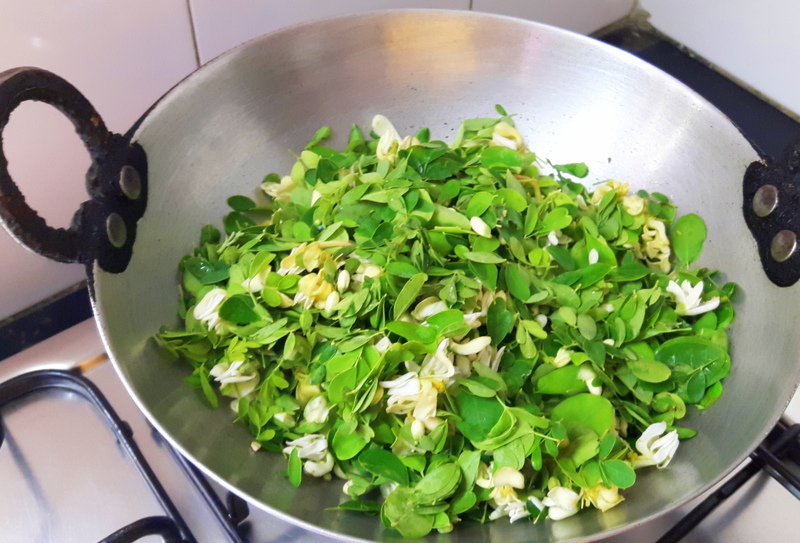 Clean, wash and Chop chaulai leaf roughly. Keep aside. 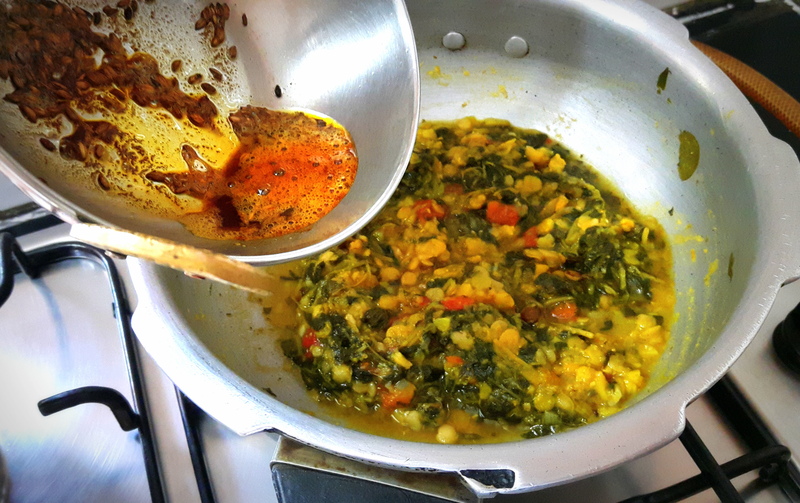 Clean and wash masoor dal, keep aside. 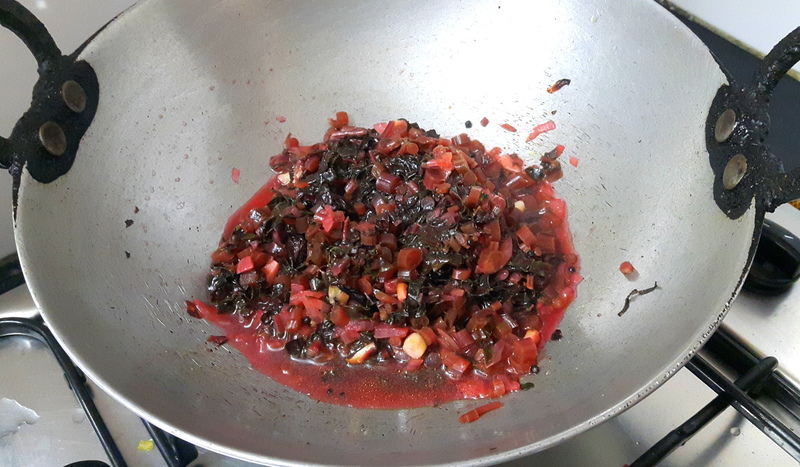 Chop, onion, tomato, ginger, green chili and garlic into small pieces. Keep aside. 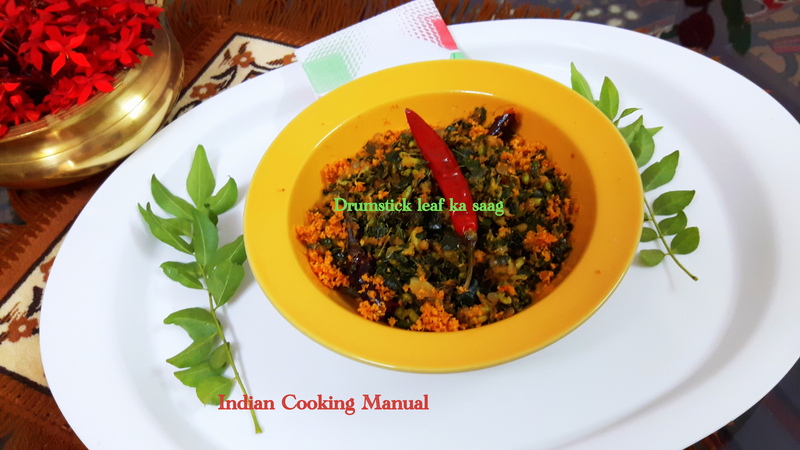 Take pressure cooker; put all ingredients except seasoning, on high flame with ½ cup of water. 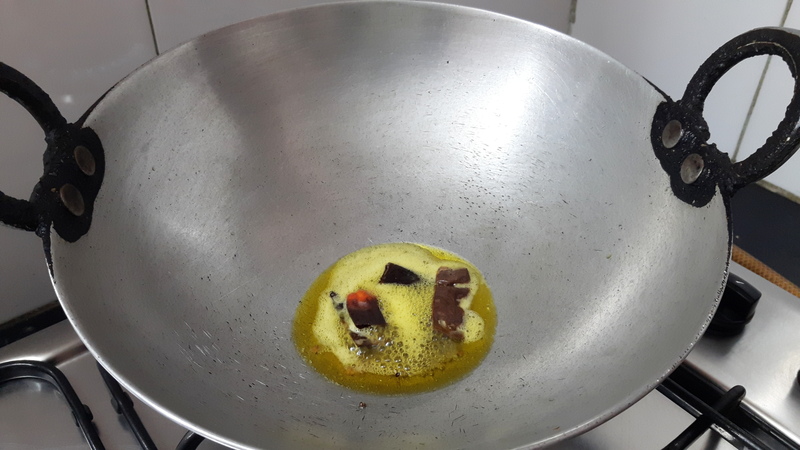 Bring to full cooking pressure, reduce to low flame and cook for couple of minutes. Put off the flame. 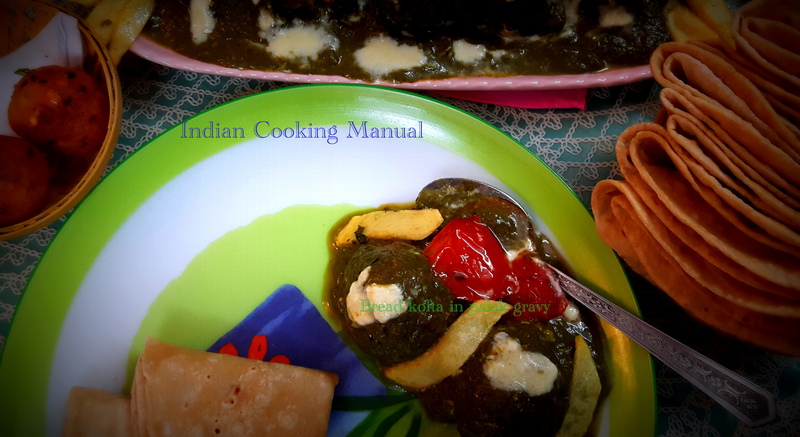 Allow cooker to cool and open, mix well with little pressing manner. 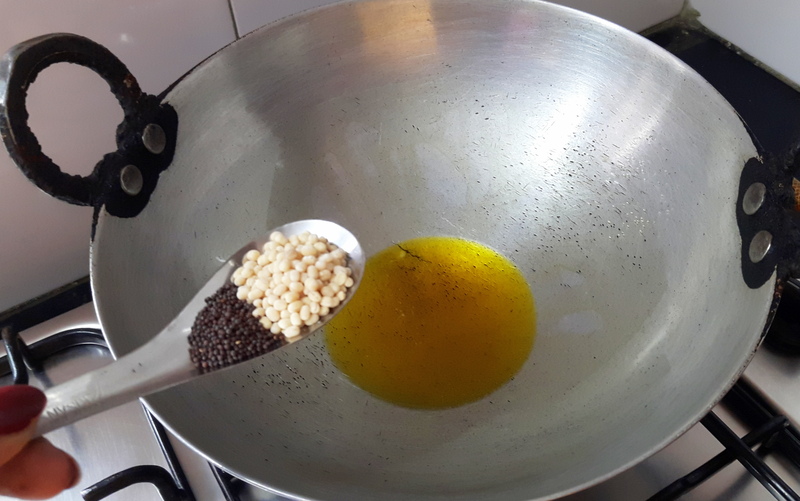 Add cumin and mustard seed, sputter for few seconds. 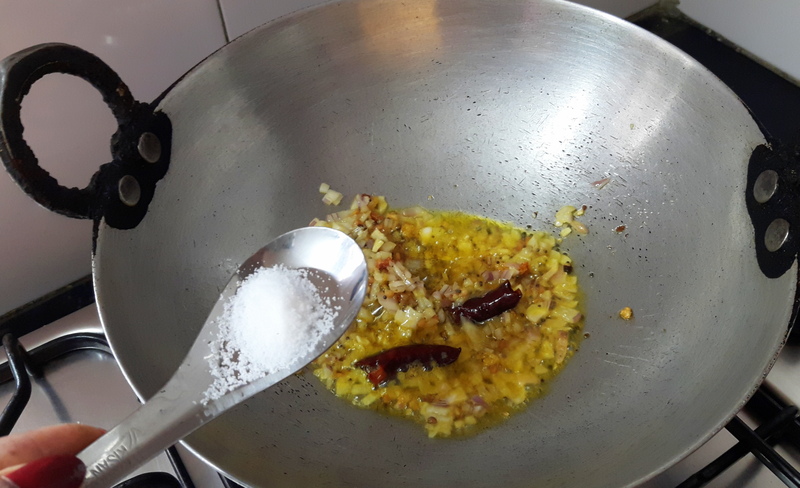 Transfer the seasoning into cooked dal and cover it. 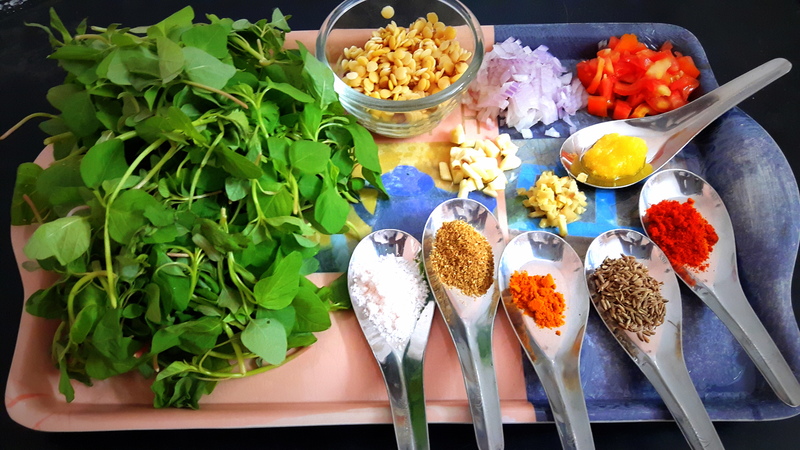 Decorate with chopped coriander leaves (for decoration fried tomato also can be used). 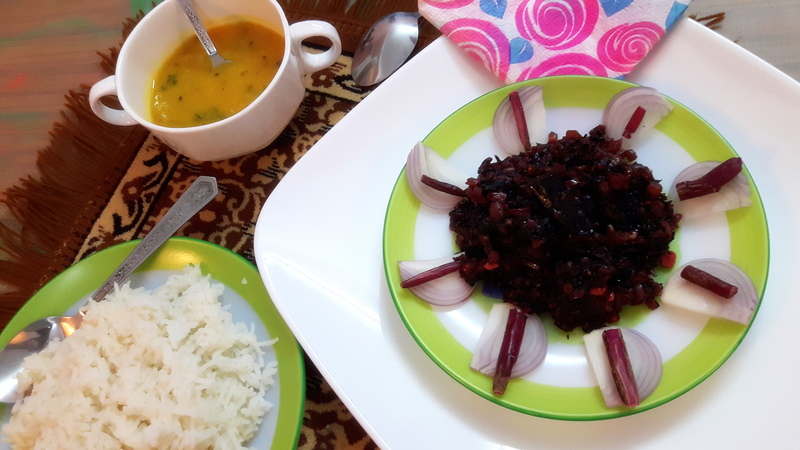 Serve hot with roti, or rice. 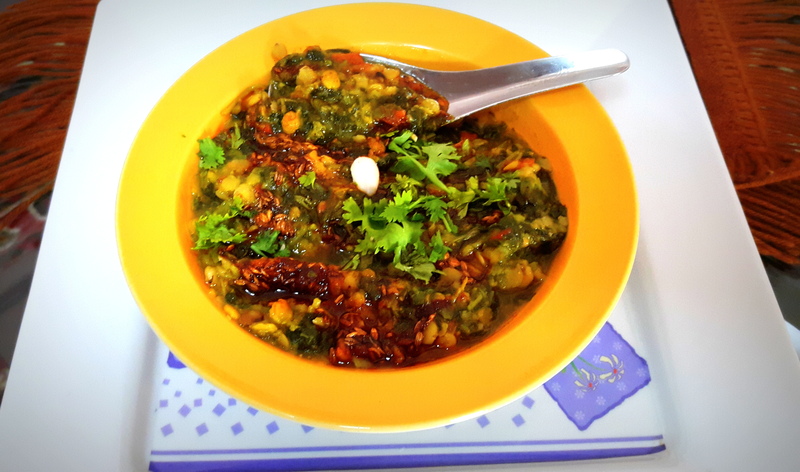 Now, Jhatpat saag (Chaulai /amaranth) ka is ready to serve. 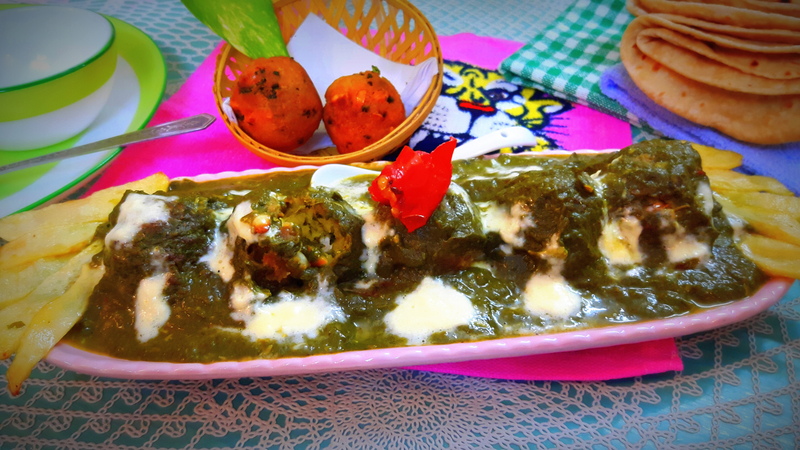 It may be served with any type of meal. 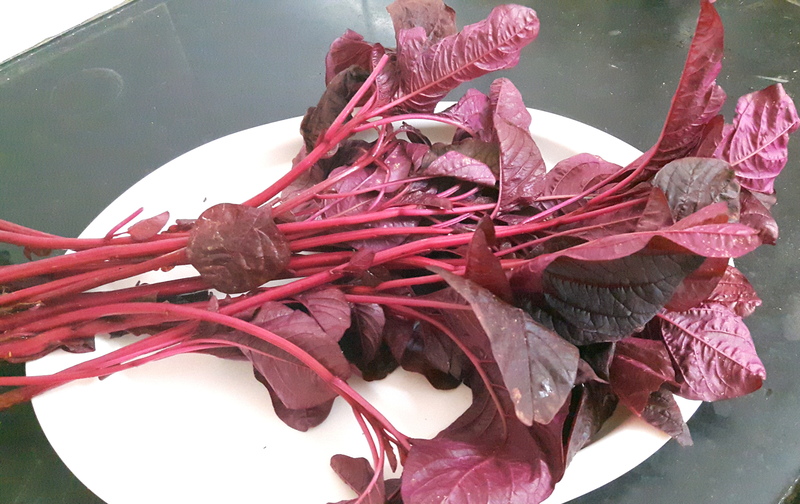 Regular consumption of Chaulai (amaranth) reduces blood pressure and cholesterol level. This is power house of iron, vitamin A and c.